In his book “Creating Significant Learning Experiences,” Dee Fink defined learning in terms of change. He believes in order for learning to occur, there has to be some kind of change in the learner. If there is no change, there is no learning. Additionally, he believes significant learning requires that there be some kind of lasting change that is important in terms of the learner’s life. Unlike other learning taxonomies, Fink’s is not hierarchical, but interactive. This means that each kind of learning can stimulate other kinds of learning. 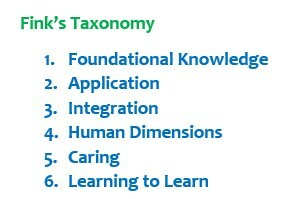 Additionally, Fink’s Taxonomy goes beyond cognitive processes and includes other goals of teaching. His taxonomy includes more affective aspects such as the “human dimension” and “‘caring” – identifying and/or changing one’s feelings. 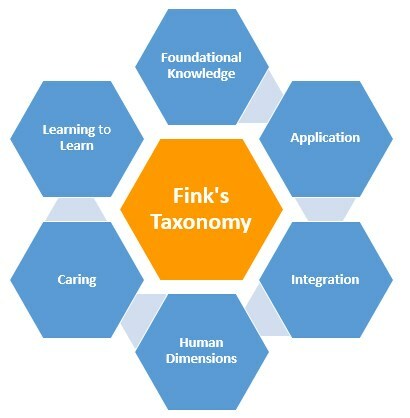 Fink’s Taxonomy includes six kinds of significant learning. This level focuses on the ability to understand and remember specific information and ideas. The objective of this level is to have the learner understand and remember important concepts, facts, terminology, and/or principles. Foundational Knowledge provides the basic foundation and understanding that is necessary for other kinds of learning. The objective at this level is to determine if the learner can apply what they have learned. This level includes developing certain skills or learning how to manage complex assignments or tasks. Participants learn how to apply a new skill by engaging in some new kind of action which may be intellectual, physical, or social. This level also focuses on learning how to engage in various kinds of thinking including practical, critical, and creative. Just like Foundational Knowledge, Application learning allows other kinds of learning to be effective. This level is about understanding the connections or interactions between two or more ideas, perspectives, learning experiences, or realms of life. At this level the learner is able to see and understand the connections between different things and apply principles that they have learned. 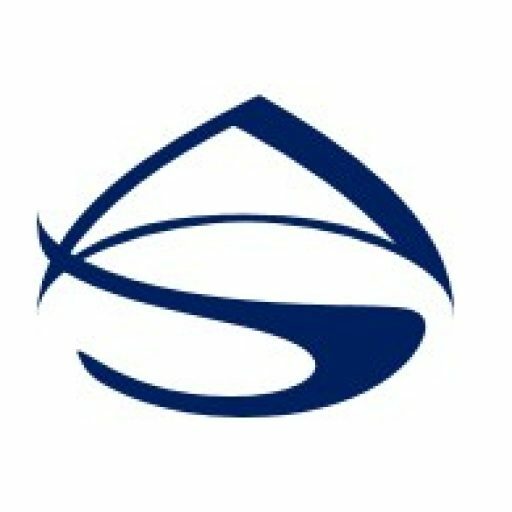 Personal Dimension: Creating and taking responsibility for one’s own life. It involves learning about and changing one’s self. A person uses reflection and feedback from other to identify areas where he or she have strengths and areas for improvement. Social Dimension: Interacting with others. The focus at this level is to get learners to care about something new or care about something in a new way. Ideally, the learner will develop new feelings, interests, and values about learning. It is about becoming excited about a particular activity or subject. Additionally, he or she wants to be a good learner and wants to be able to master material and achieve high standards for themselves. At this level, the learner focuses on how to become a better learner by engaging in self-regulated learning or deep learning. They may also learn how to learn how to inquire and construct knowledge by engaging in a particular subject/topic. Additionally, they may learn how to become self-directing learners by being a reflective practitioner and developing a learning agenda and plan. This level focuses on preparing individuals to continue learning about a particular topic or subject after the course or session is over. This kind of learning not only enables a person to continue learning in the future, but helps them to do so with greater effectiveness.